Revolutionary in weight and profile, OA Nano™ offers industry-leading high-tech comfort and pain relief, ensuring that patients will choose this safe, non-invasive treatment over other options. Patients with knee osteoarthritis today have the opportunity to treat their pain and stabilize their knees with non-invasive, non-addictive treatment options. With the launch of OA Nano™, the world's lightest knee brace at 14.2 ounces, OA patients can take advantage of the same technology used by the world class athletes DonJoy is known for treating. OA Nano is intended for mild to moderate osteoarthritis. Clincally Proven - DonJoy's Adjuster technology off-loads (mechanically shifts weight away from the damaged pare of the knee) a little - or a lot. Measurement is taken using the thigh circumference 15 cm / 6 inches above the knee cap. My right knee was diagnosed with Stage 4 Arthritis with OA in the medial are. I'm currently using the OA Everyday brace and was looking for something with a little more support when I'm more active, but still in the same size weight as the Everyday. I also took my measurements which fall into several categories, Thigh-22", Knee-17", Calf-15". Which OA brace would offer some more support, still fit under most clothing and what size would you recommend? Thank you for your question. The OA Adjuster would be a good brace for an active person. It is a bit lighter than the OA everyday and very comfortable. A large would be an appropriate size for you. Thanks for responding to my first question - to follow up... You recommended the OA Adjuster - which one them... the OAAdjuster 3 for 679.00 or the OAAdjuster Osteoarthritis brace for 649?? Thank you again for your question. The OA Adjuster and the OA Adjuster 3 are going to be very similar. The Adjuster 3 will be slightly lighter. The upright with the adjustable hinge on the OA Adjuster 3 will be made of magnesium as opposed to Aircraft Grade Aluminum. Both are going to be recommended for active life styles and moderate to severe OA. The Adjuster will be more rigid and slightly heavier, it would be suggested for larger people, or people who may be in activities that involve outside contact (example: construction workers). Please let us know if you have any further questions. Hi- I am curious about the right brace for me. I suffer from OA and have been diagnosed with a media meniscal tear as well as grade 3-4 chondrosis in the medial joint compartment. I am on my feet all day as a teacher and am looking for support in every day activities as well as moderate exercise and backpacking. Wondering which would be best, the nano, the OA Adjuster or e everyday. Thanks for your suggestions! Thank you for your question. The OA Nano is a brace more commonly used for everyday activities as well as the OA Everyday. A more appropriate brace for you would be the OA Adjuster. This brace is recommended for active people with moderate to severe OA. Please let us know if you have any further questions. Hello from the south of England! I am very small (5'1") and have very thin legs. 14, 14 and 10.75. I have only worn my new brace twice, and each time it has slipped down as I walk - a horrid feeling! Can you please give me some advice as to how I can stop it slipping down? Thank you for your question. You may need to attach the anti-migration that came in the bar with the brace. A file will be sent to your person email on how to attach that strap. I have early stages of OA affecting my both knees. I am using Don Joy Medial nano unloaders. My question is it it ok to use the treadmill with these unloaders or is there a danger of further deterioration. I requested feedback yesterday but now realize that I made an error in supplying my measurements. Could you please re-evaluate using the following corrected information. Wish to purchase Don Joy OA nano Knee brace sizes are a little of with measure ment chart, as follows: thigh 20", Knee 17", calf 16", please advise best option. I want to order a DonJoy OA nano knee brace but my measurements are a little off on your size chart: thigh 29", knee 17"' calf 16". What do you advise? I recommend you re-measure. Your thigh is an XXL, knee is XL, and calf is a L. This would require a custom knee brace. Re-measure and see if you get the same measurements. I have a script for a right lateral off-load brace. I often wear a wetsuit for kiteboarding. Can the nano brace be worn over a 2mm wetsuit? Thank you for your question. This brace can be worn over a wetsuit. Make sure to rinse the brace well after each use. Hello, My dr. is ordering me a DonJoy OA Nano Knee Brace. Can I wear it in the water? I stand up paddleboard A LOT. Yes you can wear all of our braces in the water, Just make sure to rinse any saltwater from the hinges afterward. I have strange knee shape it would seem. I want to purchase a Donjoy OA Nano, Right Medial. I have had right medial menisectomy, several scopes and a lateral release, I have OA and trying to fight of the inevitable. What size and am I selecting the right brace. Here is where your measurement fall. Looks like you may have some atrophy of your quadriceps muscle. I recommend the XXL, the thigh and calf bar are malleable, you can bend the thigh frame to accomodate the smaller size. 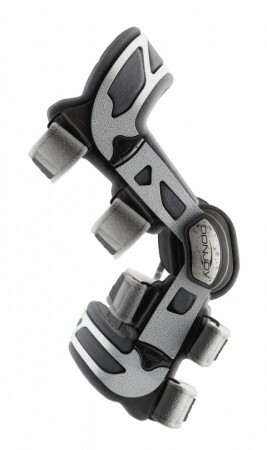 I have the DonJoy OA Nano Knee Brace which my doctor recommended I use after my second knee surgery this May. It does help a lot with my walking. I do want to know if the brace is water proof. I was reading all the information about the brace and it doesn't say if I can get the brace wet. Yes, you can use the brace in water. We recommend you rinse the brace each time you exit the water. Using OA NANO How to adjust the 1,2,3,4,5,velcro straps to prevent the hinge from slipping below the knee ? Below you will find links to videos, click on ACL Fitting. This is not your Brace but it's the same application. Each Strap is labeled, in order of application. If you have additional question please call a Product Specialist, 1-888-405-3251. I have had a lateral release and 3 scopes to remove loose cartilage, especially on the back of my knee cap. After the third scope which was 12/2012 my knee hasn't recovered as it has in the past. Pain across the front of the knee, the outside, and the inside of the back of the joint that the doctor tells me it is due to the swelling that occurs when I engage in physical activity. It also hyperextends and gives out on me from time to time, and is showing the beginning signs of OA. Which brace would you recommend for me? Thanks in advance. Do you have medial or lateral OA or Both? Find out from your Physician which meniscus is affected. An OA Brace is not recommended for someone who has Bilateral OA. It would cause more pain. Since, an OA brace shifts the weight from the affected side of the knee to the healthy side. If you are not a candidate for an OA Brace I recommend a Soft Hinged Brace or a Rigid knee Brace. For additional questions please call a Product Specialist at 1-888-405-3251. I have medial joint space narrowing. On my selection would I choose "medial"? Yes, you would choose the option "medial" which will open up the medial portion of the joint. What are the different of OA full force brace?Can this brace push from degenerated cartilage side to healthy side? Yes all of our OA Braces provide off-loading to mechanically shift the painful joint load from the degenerative compartment to the healthy compartment.